Cyan Music returns with Supersonic Architect, the debut album by Paranormal Activity (Marc Schuurmann), an eclectic and unconventional German producer based in Münster. 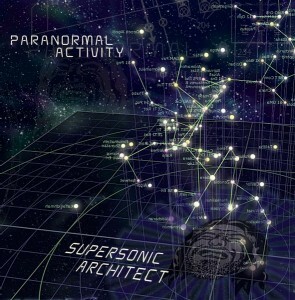 Describing his sound as “psylectric ambiental chillcore,” Paranormal Activity has concocted a strange and heady brew of deeply hypnotic grooves and psychedelic soundscapes with ragga and broken beat influences. Switch this album on and prepare to descend into a labyrinthine world of paranoid thoughs and cryptic revelations. MP3 Download | FLAC Download | WAV Download · Download count: 13,760. Released under a Creative Commons licence for noncommercial usage. Visit the Cyan Music discography for more free music. Some good dark downtempo here. I’m digging the basslines. Big beats for the Freaks. Download now!!!! Ja sehr angenehm prickelt auf den sinneszellen im Innenohr. Steckt viel Liebe zum detail drin mit kopf und herz. The cover is simply amazing. Some tracks are very good and atmospheric, and some are a bit too much “loud” for me. But the whole album is very nice ! LG Jensemann und Dortmunder Anhang…. Love it…. very dark-industrial chill. The first thing that comes to my mind is leather. Freakin’ excellent! I really like the exploratory feel of the album – really great beats.